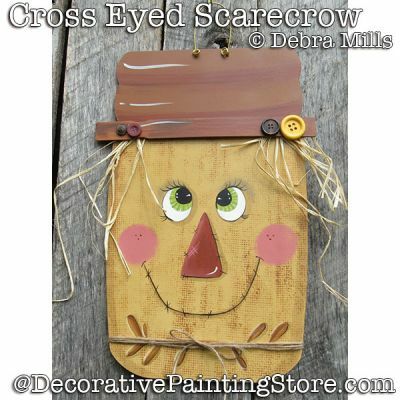 Scarecrow with crossed-eyes - door or wall hanging painted on an 18" tall wooden (MDF) cutout or surface of your choice. This pattern packet includes photos, supply list, and step-by-step instructions. There is a full-sized drawing which you can enlarge or reduce to paint on a surface of your choice. Painted with DecoArt Americana Acrylics.